We are EkoMovers. We are a full-service moving company. We offer both local and long-distance moves. 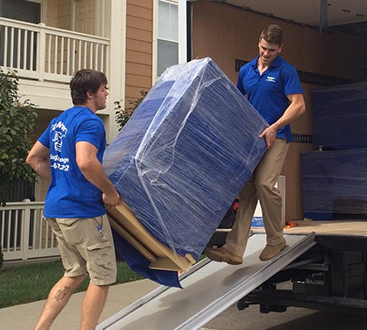 So, if you are moving just across town, across the state, or across the country, we can handle every aspect of your move. Our well-trained and professionals moving company workers can pack up, move and unpack all your things for you. If you need storage, we offer that too. We also offer vehicle and freight shipping. For the most stress-free move possible, call EkoMovers. 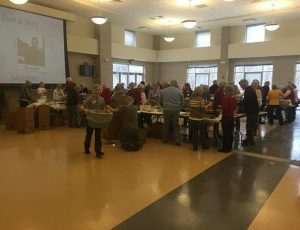 We recognize the importance of taking care of our world and have made it our goal from the start to help Earth while providing a valuable service to our community. That is what has made us the best local long distance movers available. 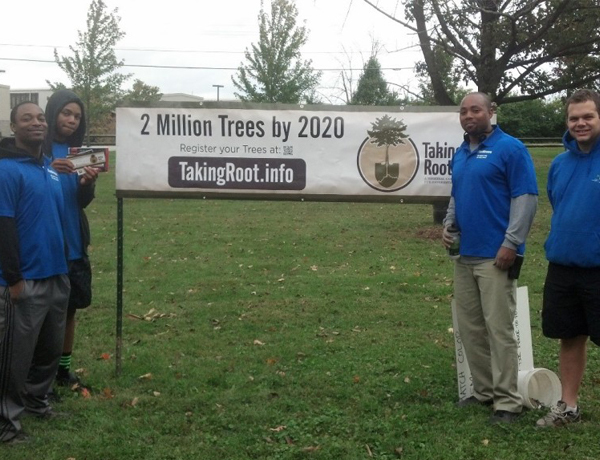 On top of providing professional moving services, we “give back” to the Earth by planting a tree on behalf of every customer we serve. It’s what we believe in. It’s what we do. EkoMovers’ mascot is a frog for a reason! No, not because he is cute! Frogs eat mosquitoes, ticks, and flies that carry vector-borne diseases such as malaria, West Nile virus, dengue fever, Lyme disease, and leishmaniasis. Tadpoles eat algae and therefore act as a natural filtration system that keeps our drinking water clean. Frogs serve as food to a diverse array of predators including birds, reptiles, fish, dragonflies, and monkeys, and the loss of frogs from the ecosystem would therefore negatively affect these species as well. Due to their permeable skin that absorbs chemicals and pollutants, frogs are accurate bioindicators, providing us with an early-response system that can tell us when something is wrong in the environment. Frogs are important in human medicine: 10% of the Nobel Prizes in Physiology and Medicine have come from research that depended on frogs. When a frog species disappears, so does any chance of that species improving human well-being. So next time you see EkoMovers driving past and you see the big EkoMovers frog, remember, we need frogs! Sharon Woods now has over 100 trees ready to set in for the winter and bloom over the years to come. Thank you to everyone who helped in every way they did. 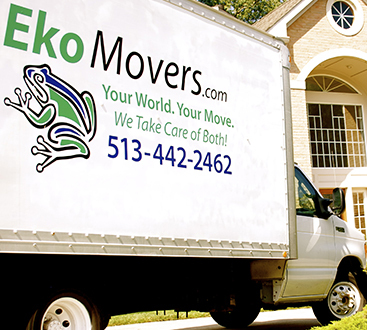 EkoMovers appreciates everything you do to help us offset the carbon footprint of moving! 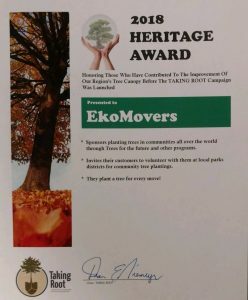 Because of EkoMovers efforts in planting a tree for each move, they were awarded the 2018 Heritage Award. We’ll continue planting a tree for each move and if you’d like to volunteer at the next tree planting contact us today. Angie’s List Super Service Award Winner! A record number of times! Only 5% of movers win this award. Winner of Top Mover from Home Advisor! A+ Rated & Accredited by BBB! Serving Dozens of Markets All over the great USA!